Your slow cooker can be used for any meal, any time of day. 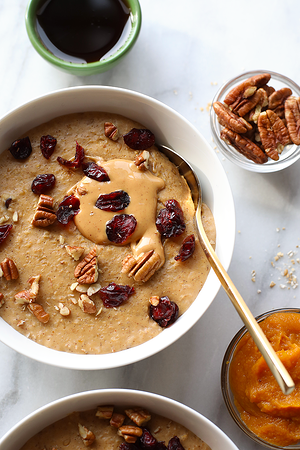 This pumpkin oatmeal is easy and delicious. It's sure to be a hit with your family this holiday season. Recipe below! 1. Place all ingredients in slow cooker and mix well. 2. Cook on high for 2-4 hours. 3. Top with chopped nuts and enjoy! If you're looking for more on-the-go breakfast ideas, check out this recipe for a Berry Bliss Breakfast Smoothie. It goes together fast and the fruit and spinach will help boost your immune system during cold and flu season. Or, if it's the sweet-tooth craving you've got, this Banana Ice Cream recipe is just for you. Enjoy!